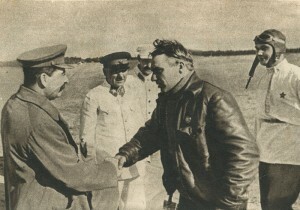 Culture | The meeting of Chkalov, Baidukov and Belyakov on the Shchelkovo aerodrome August 10, 1936. Stalin greeted with Chkalov. Close by are: Voroshilov, L.M. Kaganovich and Belyakov.